An atmospheric concert featuring new choral arrangements by composer and musician Rory Ballantyne. The eclectic and dynamic repertoire will journey audiences through both uplifting and emotional pop, rock, ancient folk, classical and experimental songs which explore ideas around death and dying. The concert will be followed by a Death Café where audiences are invited to share and discuss their perspectives on death in a friendly and informal setting - with cake! 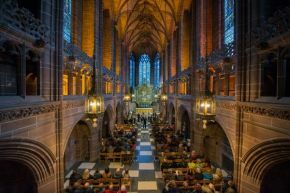 LightNight 2019 celebrates the 10th year of the free independent festival, produced by Open Culture - who are also behind Tickle the Ivories street piano festival in Liverpool ONE and the Winter and Summer Arts Markets in Liverpool Cathedral.